American Deli is a casual diner that specializes in American cuisine and offers a wide array of burgers, sandwiches and seafood. While the menu selection is large, the restaurant is particularly known for serving up stupendous chicken wings and famously delicious fried fish at prices everyone can swallow. We’ve personally sampled the wings, and the Phily Cheese Steaks offered here and are willing to extend a hard-won 4 out of 5 stars for both menu items. To round out it’s reputation for great comfort food, American Deli also offers fried rice as a signature entrée making it a bit unique among it’s competitors. Below are the latest American Deli menu prices. The American Deli story started at the South DeKalb Mall near Atlanta when they opened their first location in 1989. Locations soon began to pop up all over Georgia and the southeast. Today the company’s menu features a unique flavor profile has powered it’s success to include more than eighty locations extending all the way to California! Expansion into other states and more locations are in the works. If you’re interest in employment at the restaurant, it’s easy to find information on jobs at both the corporate headquarters located in Atlanta, Georgia or at one of the independent stores on the company website. For your convenience, we’ve included a link to their website below. For more information about American Deli, please visit their website. American Deli recently engaged HIFI Communications and director Craig Rhee to compose a series of funny and sports themed thirty second commercials. One of the commercials even featured the likes of football legend Rodney Harrison. I think it’s safe to say that football fans and the tradition of game day wings are a key part of the company’s success! You can view the commercial here. 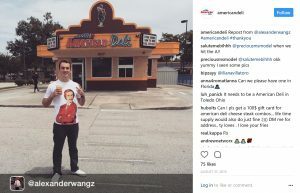 Want to connect with American Deli via social media? The company maintains an active Facebook, Instagram and twitter account. Fan’s of the restaurant have posted some great pictures of their favorite menu item furthering the American Deli slogan that “Good Times Deserve Great Food”. We found a great picture of the original American Deli location on Instagram. Check this out! When does American Deli Close?